SwRI intelligent transportation specialists are working with 10 states and Puerto Rico to help their freeway systems operate more efficiently and safely. The SwRI-developed ActiveITS™ system provides the core of these advanced traffic management systems. As Southwest Research Institute’s intelligent transportation systems expand across the country, our novel software, robot, automated driving and smart technologies are also solving real-world problems around the globe. SwRI is now providing advanced transportation management system (ATMS) technology and services to 10 states and Puerto Rico. In the U.S., building highways in urban areas can cost as much as $2 million per lane, per mile, making it financially impossible to build our way out of traffic congestion. ATMS technology quickly identifies accidents and musters appropriate emergency and clearance responses to return traffic to free-flow conditions as quickly as possible. In a related area, SwRI is also a leader in connected vehicle (CV) and automated driving technologies. Last year, SwRI introduced new data and software tools designed to identify wrong-way drivers and to make wireless communications between vehicles and infrastructure safer. A comprehensive CV test suite verifies compliance with industry standards for vehicle-to-vehicle safety communications, evaluating interoperability and data integrity when devices communicate over wireless networks. SwRI is also advancing the state-of-the-art in cybersecurity for today’s vehicles and transportation management infrastructure and tomorrow’s automated and connected vehicle technologies. While CV technology is a cornerstone for tomorrow’s automated vehicles, sensor and localization technologies are also critical to help navigate and maintain roadway position. SwRI blends these technologies for diverse applications, from passenger vehicles to low-speed automated shuttles and tractor trailers at shipping depots. 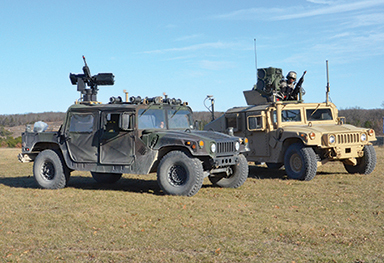 For the military, automated vehicles help protect the warfighter from hazardous situations. SwRI’s award-winning Smart LEak Detection System (SLED) uses computer vision and machine learning to detect pipeline leaks. SwRI is using drones to expand SLED’s capabilities to detect gaseous methane leaks as well as liquid hydro-carbon spills at sea. 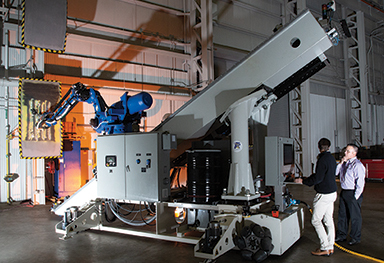 The “Wingman” system pairs a robotic vehicle (left) with a soldier-operated vehicle. Equipped with unmanned mobility, automated target tracking and a remotely operated weapon system, the robotic Wingman vehicle allows soldiers to engage targets from covered positions. This ﬂexible robot system uses ROS-I and advanced sensors to conduct real-time path planning and analysis as it moves about an aircraft. An onboard computer processes sensor data to create on-the-ﬂy robot motion paths without manual programming. In other automation applications, SwRI uses the ROS-Industrial open-source project to extend the advanced capabilities of the Robot Operating System (ROS) to advanced manufacturing. In 2018, SwRI was part of a team that demonstrated using ROS-I to bridge robot programming with the MTConnect open standard. By enabling communications between a robot and a machine tool, the ROS-I/MTConnect solution demonstrates how open-source software supports smart manufacturing applications. SwRI curates the ROS-I open source framework and is one of the leaders of the ROS-I consortium. Other robotics activities include developing a collaborative robotics laboratory to develop “cobot” technology. While conventional robots are walled off from humans for safety reasons, collaborative robots work alongside human operators, performing manual tasks. SwRI develops unique human-robot interfaces, perception technologies and advanced path planning capabilities that allow cobots to work safely and efficiently with humans. We’re also helping the U.S. Department of Defense improve system interoperability in aircraft and ground vehicles. Overseas, an SwRI-led team is developing unmanned aerial systems to fly into the containment vessels of the damaged units at Japan’s Fukushima Daiichi nuclear power station and assess conditions. Working with the client and academic collaborators, SwRI engineers are helping adapt small drones to autonomously operate within this challenging environment. Closer to home, SwRI continues to support local small- and medium-sized manufacturers, operating a branch of the Texas Manufacturing Assistance Center (TMAC). In 2018, TMAC provided strategic consulting and process improvement training, and intro-duced collaborative robotics to South Central Texas small businesses. For more information visit intelligentsystems.swri.org or contact Vice President Dr. Steve Dellenback via email or call +1 210 522 3914.